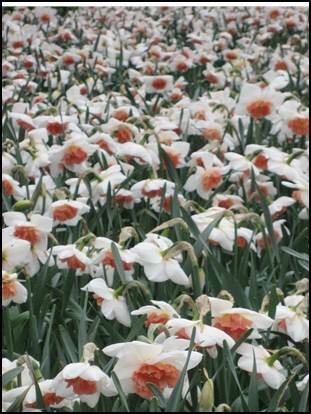 or one of the white varieties such as ‘Ice Follies’ that has a similar spectacular effect when planted en masse. A person thing but I do not thing that multicoloured floers planted this way has the same effect. 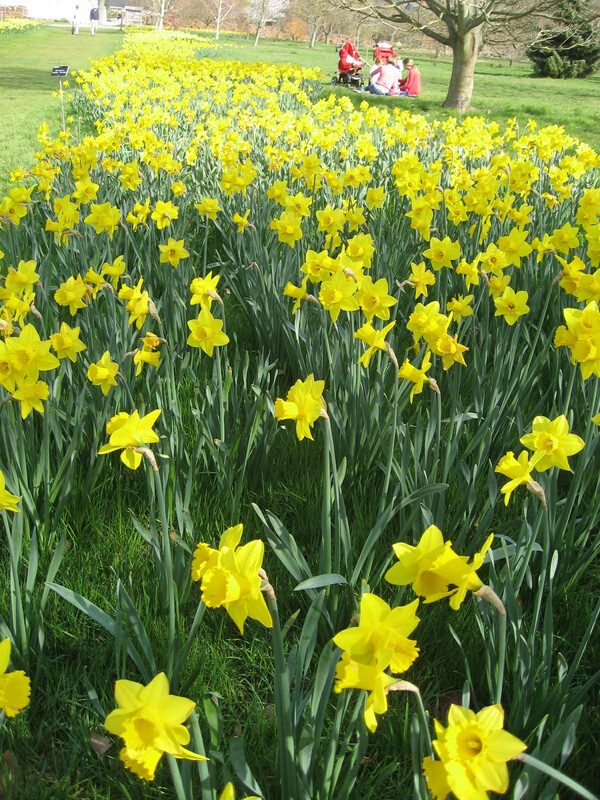 This image shows Narcissus ‘Precocious’ planted together. Although it is a beautiful variety, it deserves to be planted in smaller groups – in my opinion. Precocious in more ways than one! 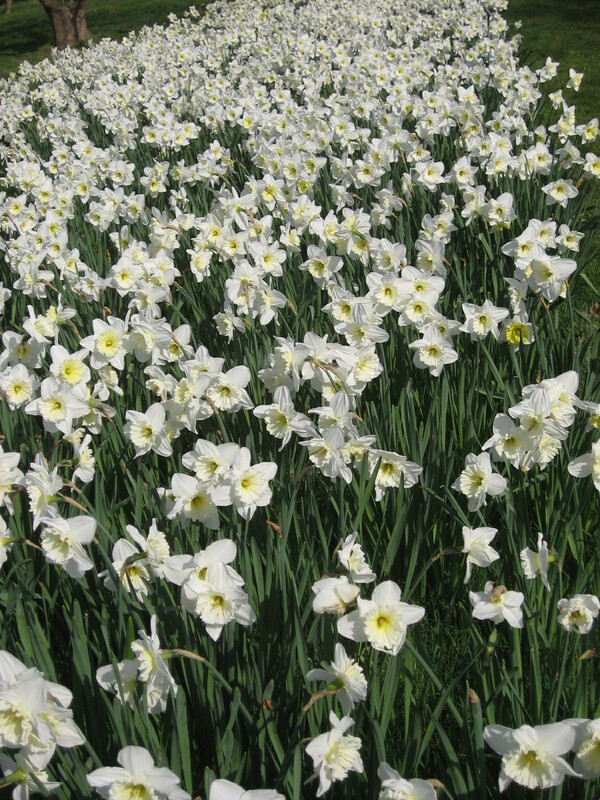 There are hundreds apon hundreds of varieties of Narcissus. Not all are attractive but varients tend to fall in a few categories – colour; colour combinations; size; shape of bloom and flowering time. So here are some that represent these categories. It has become fashionable to have upswept or reflex petals. 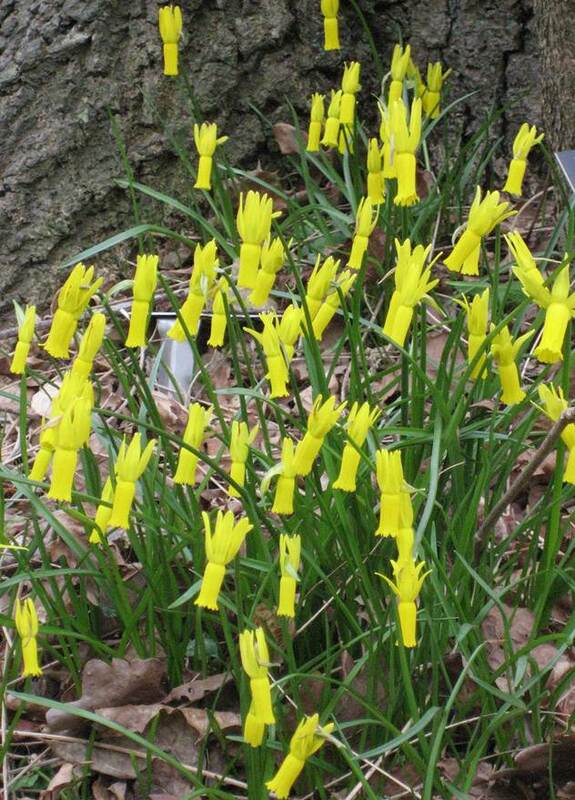 Narcissus cyclamineus is an extreme version of this. A dainty dwarf version, used as a woodland plant in drifts. this can look most effective. 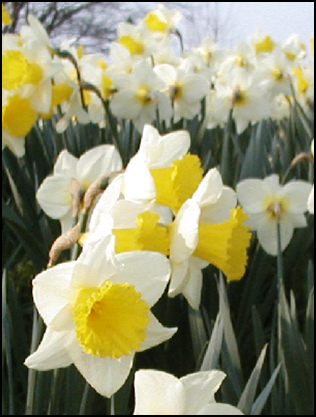 A white version of reflex petaled Narcissus is ‘Winter Waltz’ which is very attractive with its soft creamy yellow trumpet and white outer petals. However my favourite reflex petal variety has to be ‘Jetfire’. A strong yellow petal surrounds a bright vibrant deep orange trumpet. Plant in groups at the front of a border bed. These are great little plants, very tidy and striking. Dwarf varieties are extremely useful in both alpine gardens and herbaceous borders. 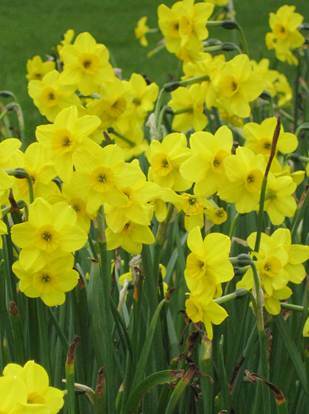 Varieties I use quite a lot include Narcissus ‘Andelusia’ which has lemon petals and a deeper yellow trumpet. 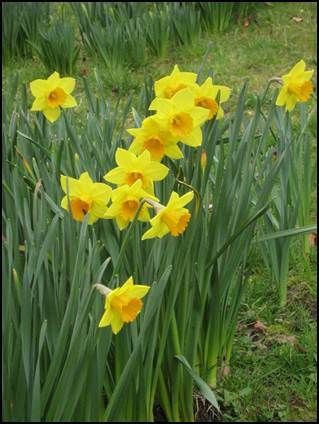 Narcissus ‘Lemon Drops’ are a pale yellow triandrus daffodil (grows with three heads). Of the bicoloured varieties there are some really stunning examples. 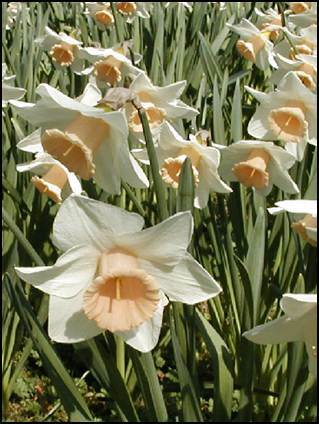 Narcissus ‘Salome’ has a vibrant lemon yellow trumpet surrounded by pure white petals. Definitely a favourite of mine. 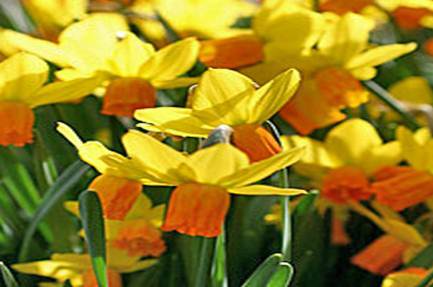 Narcissus ‘Evening’ has an open trumpet in buttercup yellow with lemon yellow petals. This is a fantastic variety. 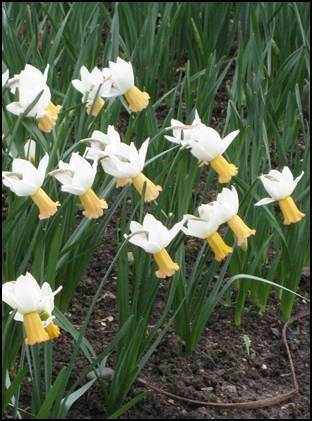 Sinilar in colour to ‘Salome’ but not in shape, Narcissus ‘Bavoure’ has a longer and narrower trumpet. 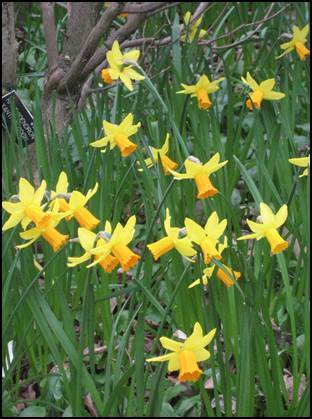 Of the single colour varieties, ‘Lemon Glow’ is a great variety. The soft lemony cream is beautiful and just slightly unusual that will create a great focal point in the garden if planted in large groups. Colour is something that can be taken too far however. 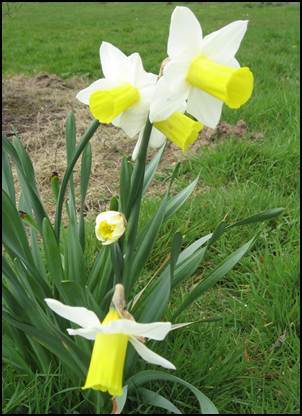 Call me old fashioned but I reckon a daffodil is yellow or white. Staying within that rough colour range is fine by me. Unfortunately in the attempt for something new, the breeders have seen the need to introduce pink into the offerings. ‘Satin Pink’ was one of the first to be brought to the market, which was creamy pink, which is not too bad, but varieties such as ‘Pretty Radiance’; ‘Romance’ and ‘Pink Pride’ are going too far. Still that is my opinion. 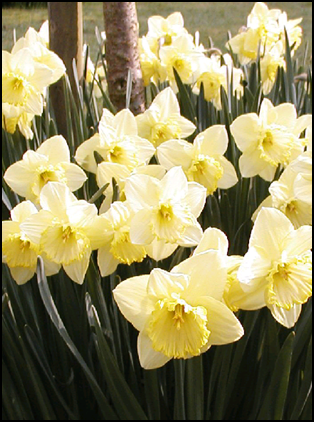 The Narcissus family is indeed a large and varied group of plants that are both important in creating a wonderful statement in the garden andone that offers all garden enthusiasts a plant to suit their taste.